Holiday Inn Aruba is in a perfect location for swimming, snorkeling and scuba diving in Aruba. The Holiday Inn Sunspree Aruba offers a great opportunity for friends and family looking for unique Aruba vacations. Guest rooms allow you to overlook the pristine waters of Palm Beach Aruba via a balcony or patio. Every room has a mini refrigerator, coffee maker, satellite tv, hair dryer and ironing board. There are differently styled rooms to choose from such as the Standard Room, Superior, Lanai Roomand Garden Suites. Staying connected is easy with Wi-Fi available throughout the resort as well as in-room wireless access. 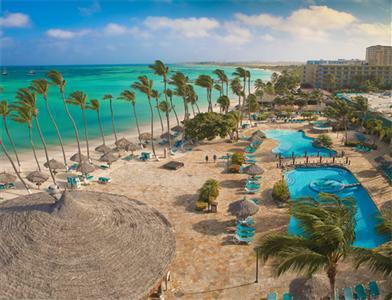 Holiday Inn Sunspree is not to be left out when considering Aruba All Inclusive Resorts while staying on the island. Be sure to inquire about their specials.